Two trips to the Dial Range allowed me to find these walks. The first day Isaac and I only had a couple of hours available to get there and back from Camp Clayton. We climbed Mount Gnomon, and on the way found the track to Mount Dial. I went back myself the next day and did Mount Dial and the little circuit onto Mount Gnomon from the Mount Dial Track. The Dial Range from Turners Beach, Mount Gnomon at the southern end of the cliffline (left) and Mount Dial to the right of the cliffs. It seems the best place to climb both these peaks from is the Mount Gnomon carpark. 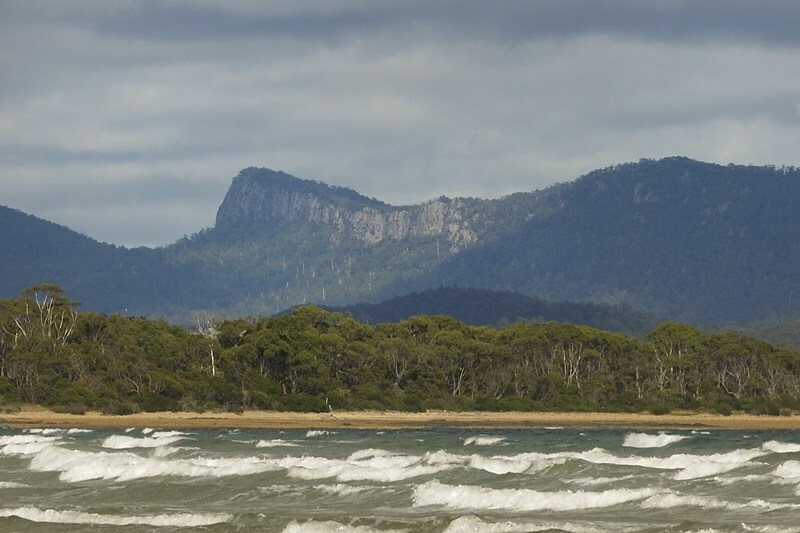 All the details are laid out in Jan Hardy and Bert Elson's Family Walks in Northwest Tasmania. From Penguin you head south, across the highway, or if approaching from Ulverstone, you turn left off the highway, and use some streets to get onto Ironcliffe Road and keep heading south, past the Ferndene State Reserve, until you get to the Gnomon carpark, which is signed. Careful, there are some nasty potholes. A bloke we met on Mount Gnomon said that the road gets worse (much) after the Gnomon carpark, and may not be passable to normal vehicles. Ulverstone seen from Mount Gnomon. The track heads up the hill quite steeply in places, but it only take 15 or 20 minutes to climb Mount Gnomon. 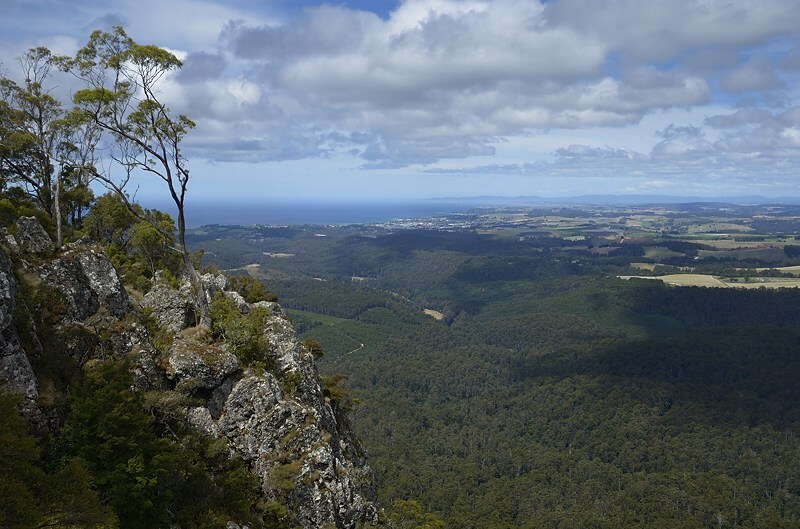 You can find the highest point along the track among trees, but keep going until you emerge on the cliff face. This is the southern end of the cliffline you can see from Turners Beach. 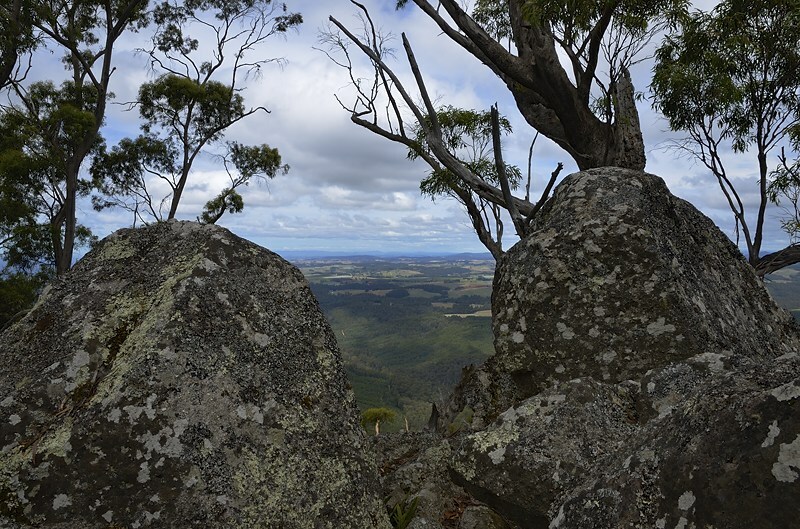 You can also see Mount Duncan to the south, and extensive views of the farmland to the east. Well worthwhile actually. 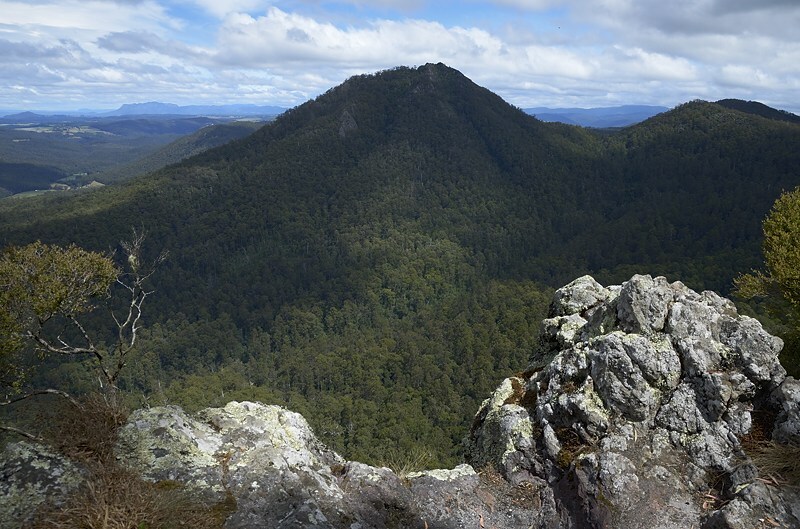 Mount Duncan, seen to the south from Mount Gnomon. Mount Dial can also be climbed. The track from here to Mount Dial branches off before the last climb onto Mount Gnomon, and meanders down and then up along the ridge between the two. There is a good vantage point towards the northern end of the cliffline very close to the track. When I came out to look at the view here, I startled a peregrine falcon which took off carrying its dinner, and spent the next five minutes complaining loudly at me from some new perch further along the cliffs. I think it took me about 25 minutes to travel along the ridge and find the top of Mount Dial. 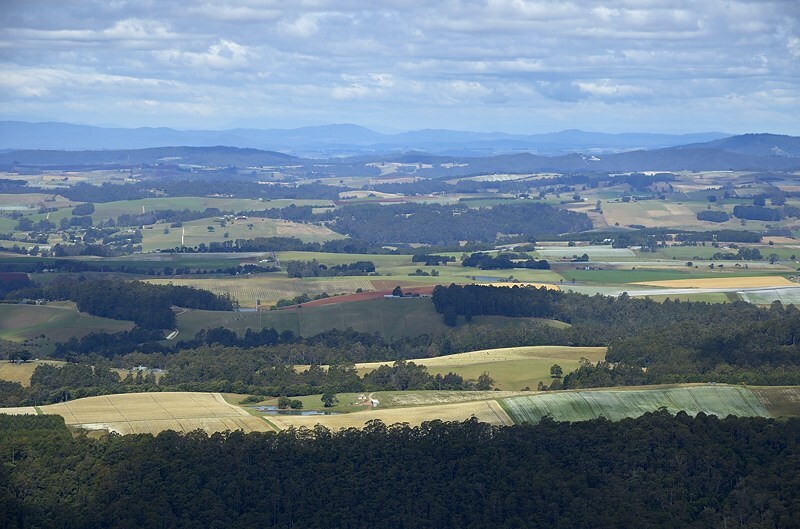 The farmland of northwest Tasmania, seen looking east from Mount Gnomon. The track climbs onto Mount Dial, and you come up onto the ridge and find a track junction turning back sharply towards the south (right). This track clambers along the ridge, and you are left to guess which pile of rocks is the highest. I climbed around or over three until I was fairly sure the ridge further south was lower than where I had climbed to. The views from here are not as easy to obtain as on mount Gnomon, and I'm not sure of the value of this peak on its own. in fact, I think if time is available a complete traverse of the Dial Range is probably in order, so I might see if I can find time in the future.